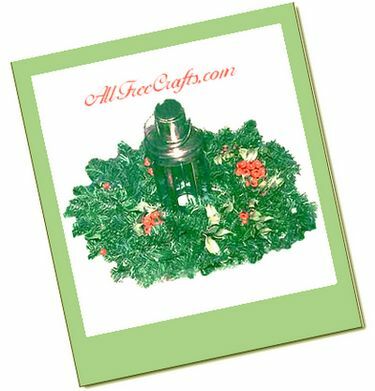 Doesn’t this lantern centerpiece look nice enough to feature on a Christmas card? It will look even better decorating your hallway or front porch, and just gorgeous on a natural wood dining table or glass coffee table. You can glue the lantern and wreath permanently to a plate, but I use mine only to support the arrangement. Set your wreath flat on a plate. Place your lantern in the center opening of the wreath. Insert berries and holly throughout the wreath. You can secure the holly and berries with wire or glue but it really isn’t necessary and leaving them loose will allow you to easily change around the arrangement if you wish. For this wreath, I used fresh holly and artificial berries. These look magnificent when all of the parts are natural and you can add a few pine cones too. Alternatively, you can experiment with the placement of different ornaments. This works particularly well if you have a theme for your Christmas tree; just include three or five coordinating ornaments around the wreath. Odd numbers usually work better from a design perspective. Copyright &copy; 1999-2015 Susan Spatone All rights reserved.